Lots of games have pitched themselves as Dark Souls in 2D, but Salt and Sanctuary is the first game to make a legitimate claim. It’s also excellent. It’s been a few years since we’ve heard from Dishwasher creator Ska Studios, the tiny development studio primarily made up of designer James Silva and art lead Michelle Silva. (Yes, they’re married.) They’ve been quietly working on Salt and Sanctuary for the last few years, and while it’s been billed as “2D Dark Souls,” I wasn’t sure what that meant until now. As it turns out, it means what you think it means. Salt and Sanctuary is a demanding action game that pits players against seemingly impossible odds. Just like Dark Souls, you’ll die a lot in Salt and Sanctuary before it clicks. Even when it does, something unexpected happens and you’ll die anyway. The premise is simple enough: the land has been engulfed in war, but a royal marriage may finally bring peace. The player is part of the princess’ royal guard, but you screw up and she gets kidnapped. Waking up on a mysterious island full of monsters, it’s your job to somehow get her back. 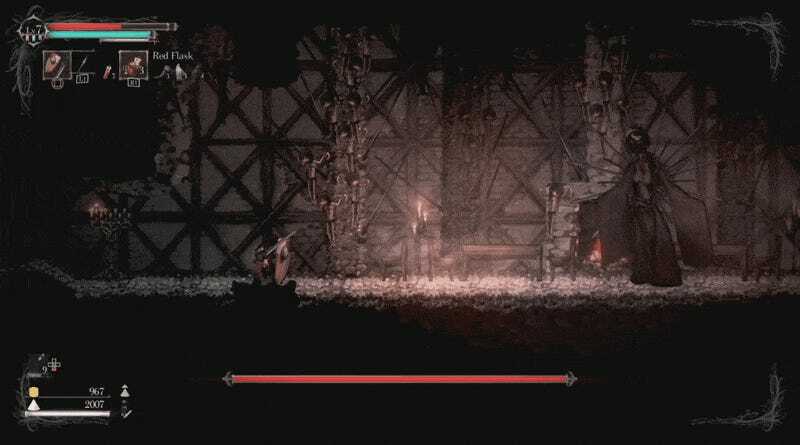 Just like Dark Souls, you’ll die a lot in Salt and Sanctuary before it clicks. Even when it does, something unexpected happens and you’ll die anyway. What exactly does Dark Souls in 2D mean, though? For series veterans, it’s an adjustment. Losing the ability to circle around an enemy, a hallmark of Dark Souls combat, takes some getting used to. It feels restricting, at first. Though you can’t move in 3D, the game gives players some new options. Two, there’s a legitimate combo system, a carryover from Ska Studios’ previous games. This means you can do some gnarly things to enemies, like send them flying into the air and attack while they’re unable to respond. Some games would probably bristle at being so closely compared to another, but Salt and Sanctuary doesn’t seem to have a problem with it. I mean, the comparisons are really hard to ignore after a while! You level up and respawn at bonfires shrines in the world. When you die, you lose your souls salt. Players replenish their health out of an estus red flask. After defeating a boss, the game declares them defeated vanquished. You’re stuck with a stamina meter that limits attacks and moves. The world is a large maze that gets smaller as you find shortcuts. Around every corner might be a treasure chest...or a boss battle. Players can leave bottles around the world with cryptic messages. None of this is meant to denigrate the game, of course. I love how much this game unabashedly embraces what From Software’s been doing in 3D, and plants a fresh twist on the idea. It’s both Dark Souls and its own thing. I’m only a few hours into Salt and Sanctuary, but the hooks are digging in. Right now, I’m bumbling around as a spear-wielding soldier, the kind of bulky build I usually gravitate towards in Dark Souls. But as with that game, players aren’t locked into a particular build; if you want to become a magic user or start wielding arrows, there’s nothing stopping you. (I’m starting to shed heavy armor, for example, and embracing an assassin-like approach. Salt and Sanctuary is only out on PS4 and Vita right now, but it’s also coming to PC and might hit other platforms down the line.